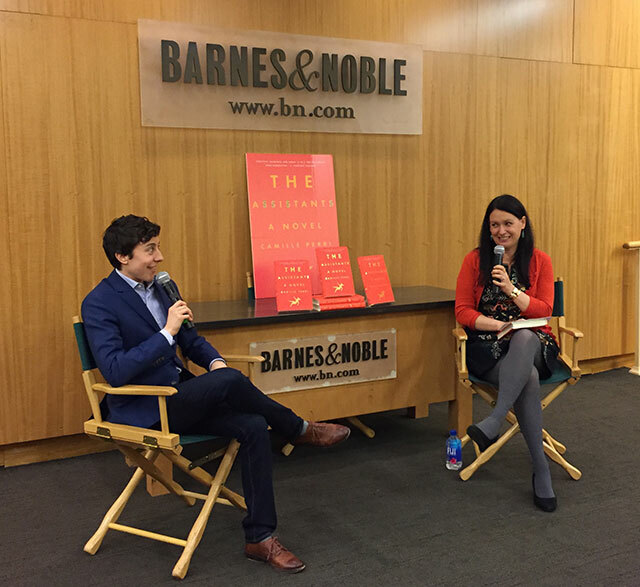 Camille Perri launched her debut novel, The Assistants, at Barnes & Noble at 86th Street. The novel follows two young women, personal assistants for a wealthy media oligarch, who abuse their position to embezzle money to pay off their student loans. Perri was joined for a conversation with Elisabeth Egan, author of A Window Opens. The protagonist Tina begins the novel having received a reimbursement check in error. The value of the check is roughly equal to her student loans and after a period of debate, she cashes the check. She is immediately caught by an unscrupulous assistant, Emily, who presses Tina into service to steal more money. Perhaps unsurprisingly, the origins of the novel began when Perri worked as a personal assistant for Esquire editor David Granger. Like her protagonist Tina, Perri was saddled with student debt and she compared what she owed to her boss’s expenses. The character of Tina came through several early drafts. Perri wanted the novel to be funny and voice of the character to be sarcastic. It was the only way to really look at income inequality, she says, and still keep the reader interested. She describes it as a trojan horse of a novel. “I really wanted to write a socially conscious novel,” she says. Perri wrote the book on weekends and during her vacation. She didn’t travel, instead taking her vacation time to write the book. She didn’t see friends very often and she says she kept a disciplined schedule. Then she put the book aside for two years. The book gestated for two years and during that time Perri ghost wrote several young adult books. When she came back to The Assistants, she had about three months left to finish and sell the novel or she would find herself back in an office job. Egan says that when she first read Perri’s book, she assumed the boss would be a lot like Miranda Priestly from Devil Wears Prada. Perri didn’t want to make a villain though, because that would have been too easy. She wanted the assistants to like their boss because that felt more real, even if maybe that positive feeling is just Stockholm Syndrome. The super rich aren’t necessarily bad people, Perri claims, they often are simply out of touch with the lives of more ordinary people. The novel is fairly realistic in the sense that if this is how someone would embezzle money, this is how it would be done, Perri says. Assistants are often the people with lots of power. They sign their boss’s names all the time. Still, she warns, you will get caught. An outline is essential to Perri’s process. She knew from the beginning how the novel would end. The portions in the middle are the things that change a hundred times, characters were cut. The outline though is helpful and makes the job of writing easier.